Transjö Hytta is a small workshop in the forests of the "Glass Kingdom" of southern Sweden. It was started in 1982 by two Master Glassmakers from the Kosta Boda factory which is famous for its modern designs. At Kosta, also the oldest factory in Sweden (1742), Jan-Erik Ritzman and Sven-Åke Carlsson worked with world renowned designers and collaborated in the invention of what is now called "Mid-Century Modernism". Eventually Jan-Erik and Sven-Åke decided to strike out on their own and set up a "laboratory" for glass. It would be a place to make their own work, but with room to continue to collaborate with visiting artists, as well as a home for an international apprenticeship program. Their own work combines their extensive technical knowledge with their equally strong connection to the restrained and elegant Scandinavian aesthetic. Jan-Erik and Sven-Åke's work has been exhibited internationally in many museums and galleries. Jan-Erik Ritzman began working at the Kosta Boda factory in 1957, becoming the Master of the Art Glass team in 1964, the youngest person ever to do so. Since the early 1970's Jan-Erik has traveled the world teaching and consulting, from China to Swaziland. He was the first European Glass Master to demonstrate glassblowing in the United States. 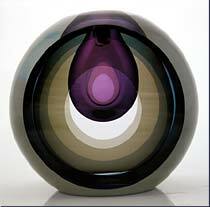 Sven-Åke Carlsson began his career in glass in 1972 at the Kosta Boda factory. In 1976, along with another Master from Kosta, Sven-Åke created the first independent glass workshop run by experienced people from "the industry". He has taught glassblowing internationally, from Japan to the United States. Transjö is the name of the small village where we are located. Transjö means Crane Lake and is pronounced TRAN-SHER. Hytta is a Swedish word meaning Glass Factory and is pronounced HOOTA.